This was the view in Kansas City about 5pm yesterday. The FAA listed average delays of 339 minutes = more than 5.5 hours. And, those delays existed even though hundreds of flights were proactively cancelled. Some responded perfectly. I received this tweet as I was writing this piece. Wonderful and heart-warming!! Maybe more responded than it first appears. But, given the news reports, the question is, why were so many trapped in cars, injured in winter weather-related traffic accidents, or stuck at airports when they could have taken advantage of the waivers offered by the airlines to rebook their flights? People were not aware of the blizzard and winter storm warnings. People were aware but were not motivated to change their flights/travel plans (leave early). The warnings were not believed. We know there is some anecdotal evidence of the third. 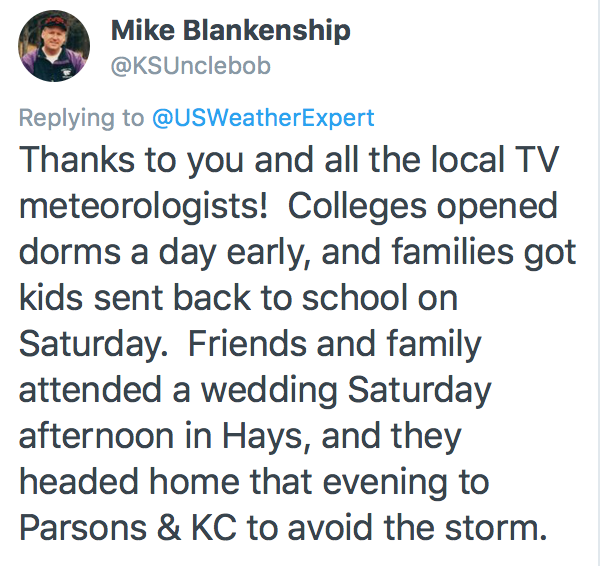 One TV meteorologist wrote Saturday. I'll leave the comprehensive answers to the social scientists. That said, let's do a quick review of the forecasts. At 10:07am Friday, I posted a series of graphics laying out the forecast for the storm, in terms of both timing and snowfall amounts. More than 8,500 viewed the sequence of forecasts on this blog. Given the extremely heavy post-Thanksgiving travel period, that is a lower number than I would have expected. So, I've wondered if people were busy shopping, celebrating, etc., and were simply not paying attention. 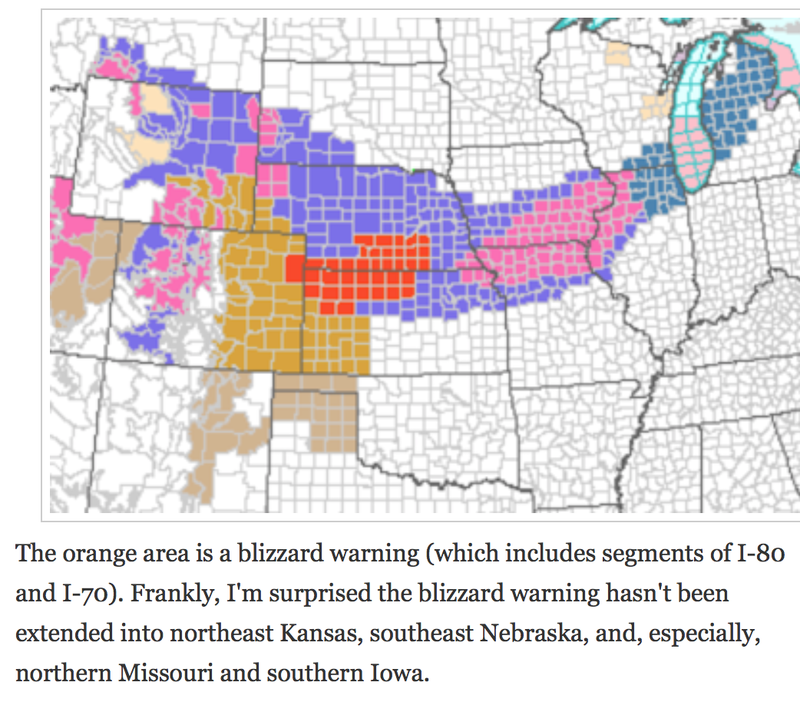 That said, I have concerns about the blizzard warning itself. My impression is that it was too narrow and too far north for too long. The initial blizzard warning (posted 1:22pm Saturday) was accompanied by my surprise the warning wasn't originally issued for a much larger area. When the blizzard warning was enlarged to include Kansas City and other areas (below), it was around 10pm Saturday. Rather late for people to change plans for Sunday. Even Sunday, the NWS was late (in my opinion) extending the blizzard warning into the City of Chicago -- which didn't occur until mid- to late afternoon. That was very late in the storm. 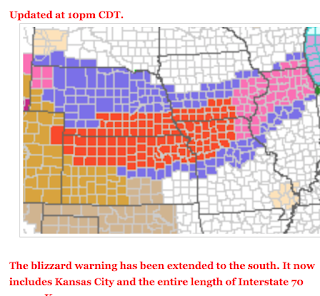 A blizzard warning is a rare event in the central United States, especially coinciding with the pre- or post-Thanksgiving travel period. While some of the older techniques showed the possibility the accumulating snow might extend farther south, a minority of the models confirmed those techniques. Plus, I fear those techniques are being rapidly forgotten as my generation of meteorologists has headed into retirement. 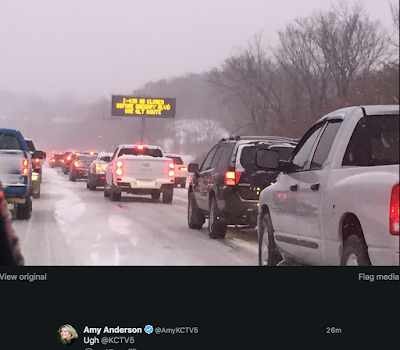 If meteorologists wrongly disrupt peoples' Thanksgiving travel plans, they will never hear the end of it!! So, there is a natural tendency to be conservative. But, did that tendency serve the public well? Finally, did the alarm systems go off (smartphone, TV weather bulletins, telephone warning systems, etc.) 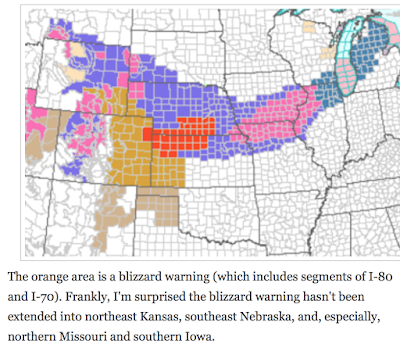 that people now depend on when a blizzard warning is issued? I sometimes wonder if we over-focus on tornadoes? There are a lot of issues with how winter storm warnings are issued but those are for another day. My impression is, for an early-season storm, the system worked reasonably well. 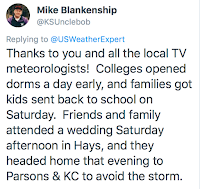 However, I would like to see meteorologists be given a college course or instruction in risk analysis rather than conversations among untrained meteorologists trying to figure it out in good faith. I would also like to see the public have more faith the warning system.